Hello to all you shorts wearing, sunglasses donning, SPF rubbing, flip-flop running, snowboard grabbing, mountain hiking, powder tearing, what the hell happened to our Spring enthusiasts. I'm really tired of hearing weather personalities say “Snow In April? !” on the air, as if they believe they're the most clever and impromptu journalist the station has ever hired. And they all do it. It harkens back to that “Family Guy” joke about the guy who stares at a cloud and tells his wife “To me it looks like... rain! I used that joke at work! I'm the funniest guy at the office.” ...We live in Utah, the snow has hit April like this five years straight, we've become accustom to it. Now stop trying to be personal with me through the signal and tell me when it will stop. In lieu of a 337 update, here's something I think we all can agree upon. --- Not much in news, other than there was a Bike Joust set for today but that got postponed due to weather (check back in two weeks for an update on that), so we'll go straight into events. 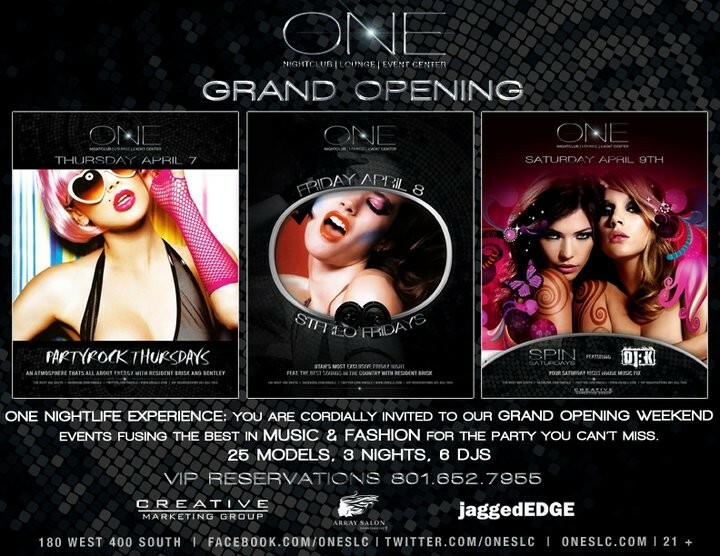 Starting with the opening of a brand new club tonight called: ONE. Its sitting at 180 West 400 South, which should sound familiar to clubbers as the home of the recently departed Quantum Ultra Lounge, and before that it was Simply Sushi for food lovers. I'd tell you more but the last time I tried contacting these guys when it was QUL, they never replied. And as of this morning, still haven't. Which is funny since they love to promote themselves on Facebook. But we won't hold a grudge. If you'd like to see what they've done to the place they'll be throwing their official grand re-opening party tonight as the final part of a three-day extravaganza. 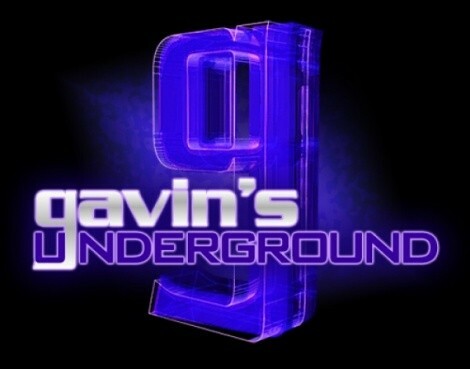 If you love the clubs and want something new, this will be worth checking out. Tomorrow night over at Mo's will be an awesome little comedy experience that I wish happened more frequently in this city. 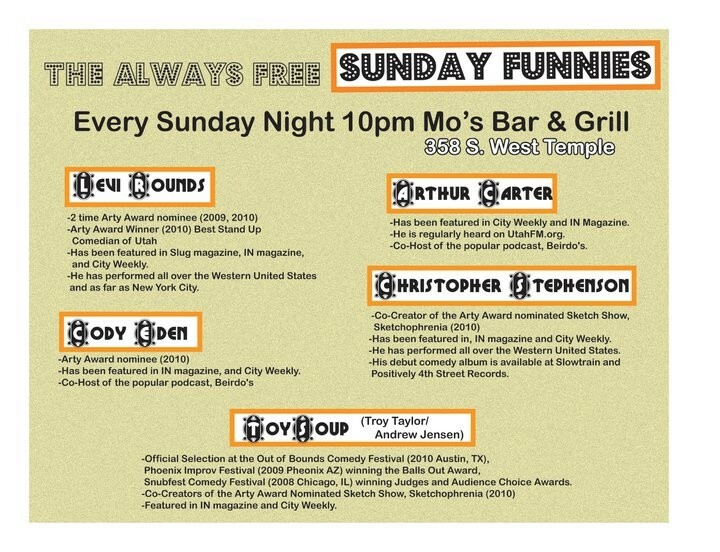 Usually the place is home to a free show called Sunday Funnies, hosted by our old friend Cody Eden, featuring local comics trying to bring you a little happiness to the end of your weekend before the pain that is the workweek sets in. But there's a little change coming tomorrow night with the introduction of “Secret Satan”. Essentially all the comics who participate will have their names thrown into a hat, and in the same vein of the canceled-too-soon “Benson Interruption”, each comic will be heckled by one of the others on the bill as they perform. And as an added bonus, they've moved the show up to 9PM from now on. So while the ad below is technically wrong on time, its correct everywhere else. 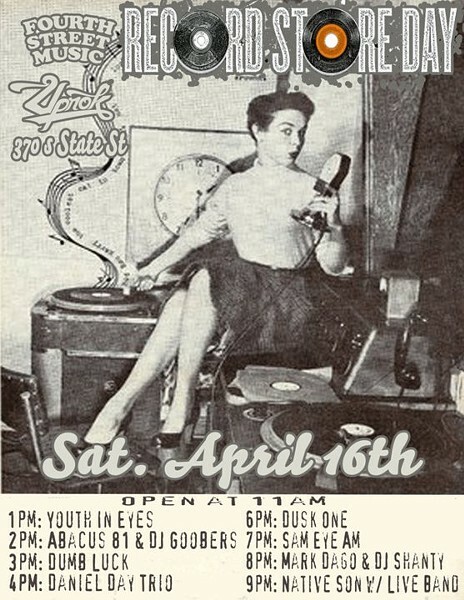 Then next Saturday is the impending multi-location musical showcase that is Record Store Day. I'm going to short-hand this one because I know City Weekly will have something on the shows, and I won't steal the thunder. 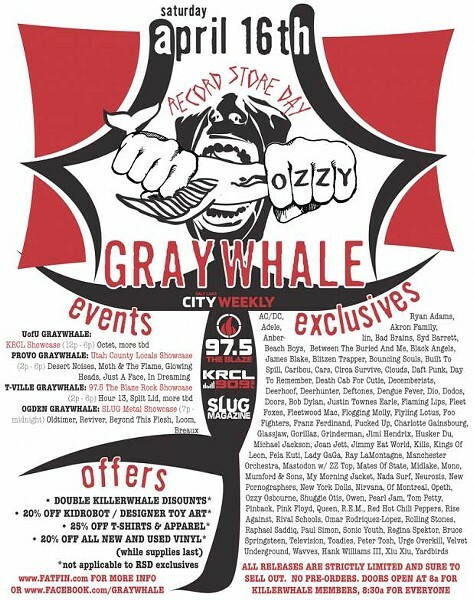 What I will tell you is that local favorites like The Heavy Metal Shop, Uprok, Slowtrain, Raunch, Randy's Records and Graywhale will all have RSD albums for sale, plus many of those shops will have live performances from local bands happening all day long, plus other vendors and booths with goodies in store for all who show up. But every location is different, not to mention the few stores outside SLC who will be participating like Groovacious in Cedar City and Music To The Maxx in Layton. And with any luck the weather will hold out to a decent spring day like predicted. Here's a couple of posters showing what you can expect. Then later that night when all the RSD stuff is done, we've got two proms happening! 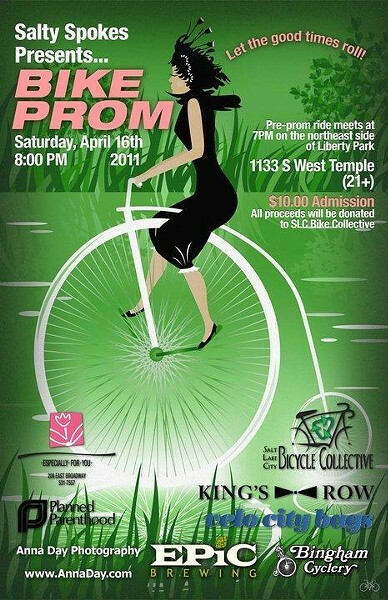 First on the list is the Salty Spokes Bike Prom. For you cyclists looking to have an old fashion prom with the twist of your riding passion, grab a tux and a date along with your bike and head on over to the northeast end of Liberty Park at 7PM, and then ride to the official prom that kicks off at 8PM. The event is $10 and you most be 21 and over to go, but there will be a raffle and other surprises like the traditional photo area. You can pre-purchase tickets from the SLC Bike Collective, and you can click their Facebook link here to check out details and special offers on dresses and tux. Meanwhile over at the Main Library, the younger LGBT and allied youth communities are invited to the 2011 Queer Prom. An all too painful reminder of the state of some public schools, many in the state have banned same-gender couples from attending school functions together, such as the ever endless supply of proms. Granted, not all, some have gotten over the exclusion and allowed everyone to come as they wish, but there are still many institutions who go so far as to make it school policy to keep that kind of ban in place. 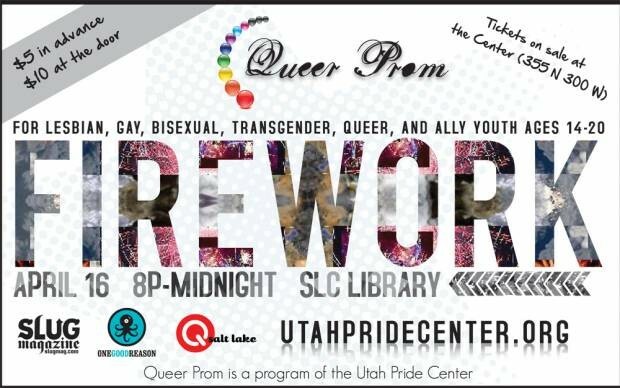 So for those who can never attend, the Utah Pride Center has put together an event for you. Held on the main promenade of the library, teens and young adults between the ages of 14-20 are invited to a night of music and fun in a safe environment. Every year this prom is a hit and it gets bigger each time. For those of you attending, enjoy! As for the blog... coming up in the next couple weeks we'll cover Gallery Stroll, showcase a concert, hit up Record Store Day with some live shows, check out two different theatre productions and celebrate another blog's anniversary with a party. At least that's the plan, and more than likely, I'll piss off more people along the way. As always, we'll see what happens.